Apparently, a one-way trip to Mars was too good to be true. Put away the list of people you've been wanting to ship off this planet because the option of sending humans to Mars is off the table. At least it is for one company. Mars One Ventures, the company that claimed it was going to people on a one-way trip to Mars, has gone bankrupt. In breaking news: nobody is shocked. The company is based out of Switzerland, and reports have said that the company was declared bankrupt in mid-January. It's not surprising, as Mars One Ventures has widely been considered a scam from the get-go. For the extra-gullible, wannabe space travelers among us, it probably seemed like a dream come true: take a Mars One Venture rocketship to Mars to settle the Red Planet. You would set up the first human colony, never to return to planet Earth. While it is unbelievable, there were more hopeful astronauts who applied than you might think. The company originally claimed it had over 200,000 applicants (which no one can verify), and announced that it selected 100 candidates to potentially take the one-way trip. Skepticism about the venture has been astronomical, to say the least. Mars One Ventures claimed it would fund and purchase all necessary equipment for the colony, to be set-up by robots prior to the first human mission. Funding for it all was going to be raised by making the project a reality show (come to think of it, I wouldn't be heartbroken if they sent the Kardashians to Mars). Experts (and anyone with a brain) speculated that the technology for the project isn't even close enough to undertake an endeavor, and the costs would be in the hundreds of billions of dollars. In addition, the company was continually revising its timeline, which began with the robotic missions in 2018 that were pushed back to the mid-2020s. The first crew of humans to launch was pushed back from 2025 to 2031.
Who knew building a colony on Mars was so easy? Courtesy of Mars One Venture. But you can't keep a highly suspect, bankrupt company down for long, it appears. 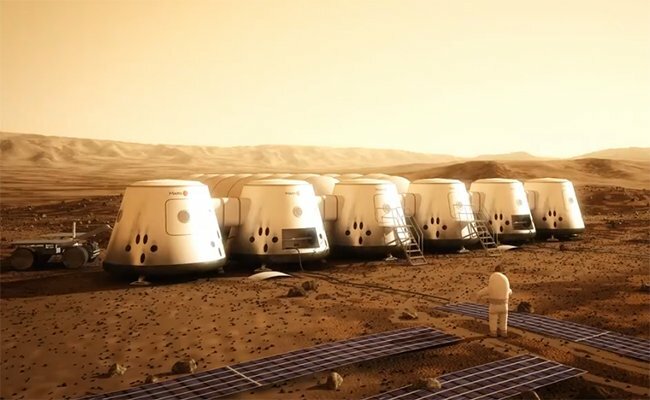 On February 12, Mars One Ventures released a statement detailing its next steps, and possibly a new investor. "For the execution of the actual voyage to Mars, the company will continue to seek strategic collaboration with renowned companies and organizations involved with the travel to Mars. Mars One itself will focus on the even more inspiring 'being there,' the adventurous story of humans actually living on Mars, making The Red Planet their new home. Utilizing its new investment plan, Mars One Ventures will establish a marketing machine, creating continuous content about these activities, evaluated from all angles, including technological, psychological, economical, and ethical aspects. The new investor will present its plans at a press conference on Wednesday, March 6, 2019, at a location to be determined," the company said on its website. What do you think? Is it all a scam? Would you apply to take the trip? Let us know in the comments. This startup is offering a "100 percent fatal" service to preserve and upload your brain to the cloud.